Click here or click onto the photo for a full size version of this picture. This is another variant of the common 20 MHz Model 70. The machine itself has nothing special, everything about it may be read here . I used this machine to demonstrate how to add a second hard drive to a Model 50 or 70. Since DBA drives with more than 160 Mbytes are unavailable, it is quite easy to hit the ceiling of storage capacity these days. 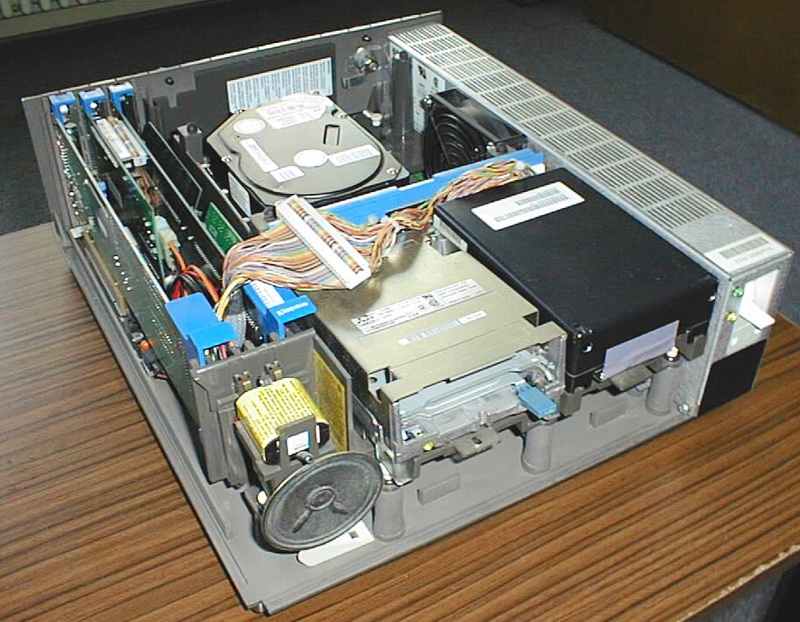 If you want to keep the internal drive, adding a SCSI controller is the only practical way to add more capacity. IDE-based solutions were available from some third-party vendors, but these are rare and I'm yet waiting to see one. SCSI controllers for the Microchannel bus are however quite common and deliver usually a good performance. The simplest approach is of course to add an external drive, and for 5,25-inch drives, this is in fact the only alternative. However, if you only want to add a 3,5-inch hard drive, there is this usually an unused bay for a second floppy drive. Honestly, who needs a second floppy drive in practice unless you want to build up a copystation? Basically, you can choose any SCSI controller you want. Common choices are the IBM SCSI controllers, the Adaptec 1640, and some other third-party controllers e.g. from Future Domain and Trantor. In this case, I used the IBM Fast SCSI Adapter/A, which is effectively a Future Domain MCS-700 with a BIOS slightly adapted for IBM. It is capable of Fast SCSI (10MHz) transfers, offers an active termination and is only half length. Another plus is the standard-compliant external connector, which is in contrast to the IBM controllers with their Mini-Centronics connectors and cables not below 100 DEM in Germany. A real benefit for our application is that it offers a power connector for a drive; if you have the IBM OEM variant of the controller, the connector is probably not populated. Adding it is however not too difficult if you know how to hold a soldering iron; apart from the connector, only 4 capacitors have to be added. The IBM variant is commonly found in later Model 76/77 (the so-called 'Lacuna' planars), and since these have an on-board IDE interface, it might be unused. The cable used here is the cable IBM shipped with a 76i. It is a high-quality cable with the wires twisted pairwise, but a standard ribbon cable would probably work fine either. 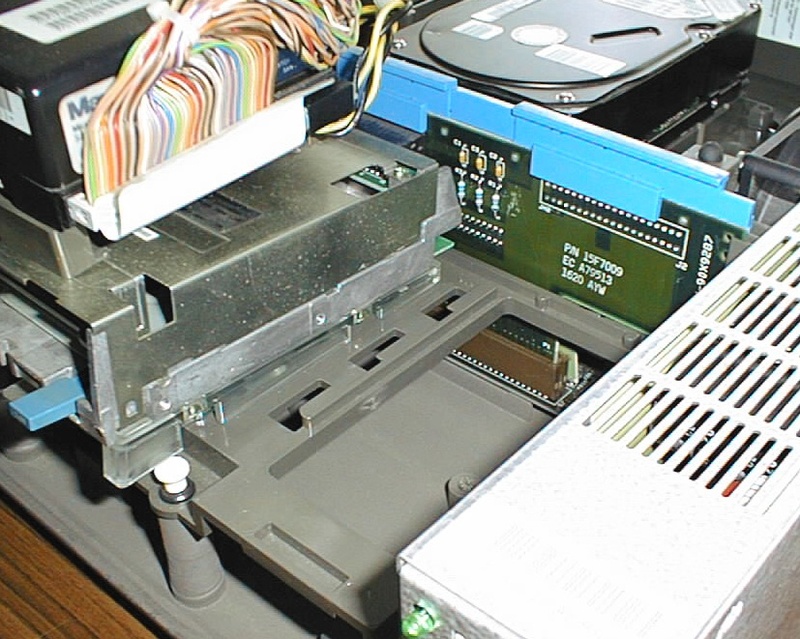 Mounting the drive is the second place where you will need to modify the hardware: The space behind the drive is extremely limited, and the floppy edge connector usually gives it the rest. 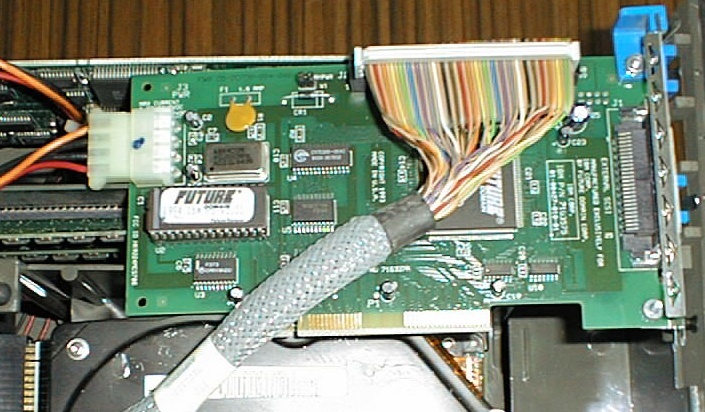 It is virtually unavoidable to remove the edge connector from the floppy raiser card. There are a lot of variants to remove it, ranging from desoldering it with a professional Weller desoldering tool up to cracking it in pieces and unsoldering the pieces. I personally took a hot air gun and unsoldered it in one step. This operation needs a bit of experience since it is quite easy to destroy the PCB if it becomes too hot, but the advantage is that the connector remains in one piece, so there's a possibility to solder it back into place if you decide one day to restore the machine to its original condition. 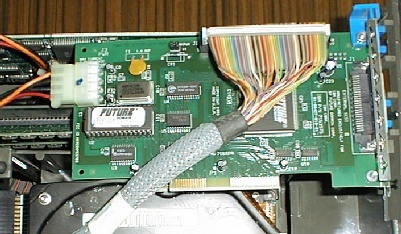 With the edge connector removed, there is now enough space for the SCSI interface connector, but a standard power connector is still too long. Try to get a power cable from a Model 80 or 95; they have ribbon-style crimped power connectors which are just flat enough to fit. Once these hurdles have been taken, the software setup is straightforward; copy the configuration file to your reference disk, run automatic configuration and you're done. Of course, SCSI disks are significantly more expensive than their IDE counterparts these days. Consider getting a used drive; drives in the range from 200..500 Megabytes are really cheap these days and provide a substantial upgrade to the max. 160 Mbytes of a DBA drive. Enjoy!